When good resaws go bad. Ouch! With the time for Al Breed's next presentation fast approaching, I got to work resawing the pieces for the case. In the photo above is the second of two pieces that didn't go well. Using up all my shop time to ruin prize lumber was a major setback. Fortunately, there's enough lumber to still get enough pieces sawn out, so I chalked this up to experience. What went wrong? I think the main issue is this is by far the widest I've ever tried to resaw. It's also very dense stuff. Even though I tried not to force the saw and it was sharp, it bowed enough in the cut that it eventually cut through the surface in the middle of the piece; that's the dark triangular patch you see, the unplaned original surface after I pulled the remainder apart. It also bowed enough in the other side to dig deeply into the wood, making it too thin. I'll be able to salvage some of this for small parts, but some is just pure waste. I even finally finished building my Hyperkitten framesaw and tried using that with a Putsch 5tpi rip blade. It worked, but introduced yet another variable in the motion as a result of side force causing twist while holding onto the frame. I think this is just a matter of skill and developing control, because I know people have used this style of saw with success, but for the moment it didn't solve my problem. Time for a change of strategy. Resawing is not the focus here. That's just an obstacle in the way of what this project is really about. I still want to do it by hand, I just have to adjust my approach. But first, the day arrived for Al's presentation to the Guild. He started off by going over the drawing. It's a bit confusing for those not used to this drawing style, because it packs some plan views in the elevation views and shows different layers of cuts and joints on different sides. This makes it all fit on one sheet, but means the drawing is not a one-for-one representation of the piece. 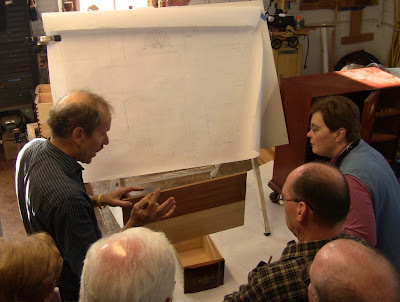 Al explaining some of the details on the drawing, relating them to a chest built by one of his students. From there, he demonstrated processes for forming the beaded molding and methods for fitting the various dividers. Thanks again, Al, for another great presentation! Congratulations are also in order; Al was just named the 2012 winner of the SAPFM Cartouche Award, no surprise to any of the participants in this program. Back home, I decided to borrow some ideas from luthiery. 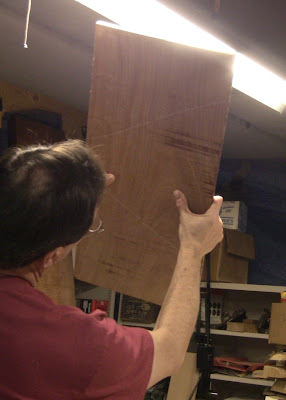 Luthiers resaw stock into thin pieces for guitar backs and fronts, then open them up and join the edges in a bookmatch. I don't need such thin stock, but I figured the methods would be useful. 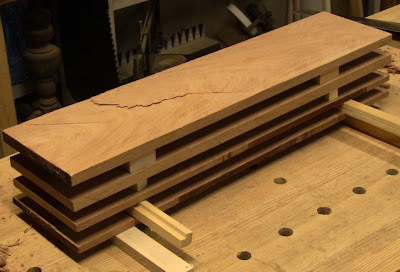 My plan was to crosscut to length, rip the piece in half, resaw the two 6" widths individually, then rejoin the thin pieces on edge back to their full width. Hopefully the much narrower resaw operation would be the key to success. 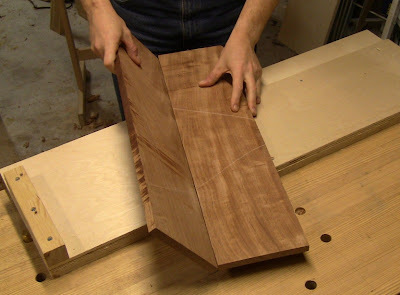 The first step was to plane both sides of the piece so it would lay flat. I didn't want to plane to finished surface, just take out the roughness from the sawmill. Before I did that, I also decided it was time to camber my jointer and smoother irons. The advice on this is mixed. Phil Lowe is a strong proponent of it. I've seen other authors recommend against it, or not mention it one way or another. 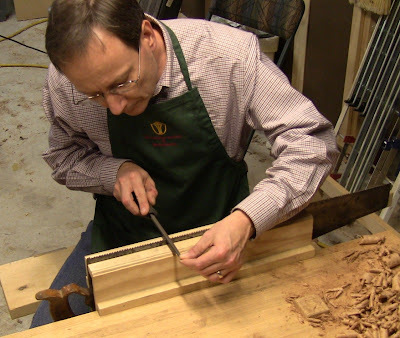 Deneb Puchalski of Lie-Nielsen, in an article in the December, 2011 issue of Popular Woodworking Magazine, recommends learning how to sharpen a straight profile well before worrying about cambering. For the jointer iron, just 10 strokes of focused finger pressure on each corner feathered out on the rough India stone, followed by medium, fine, and hard Arkansas stones. For the smoother iron, just 4 strokes. The resulting very minor camber. Cambering the iron results in shavings that feather out to nothing on their edges. Because the corners aren't digging into the surface, this reduces drag and eliminates plane tracks. With small camber like this, the surface scalloping is negligible, and you just overlap the width of your strokes to flatten that out. 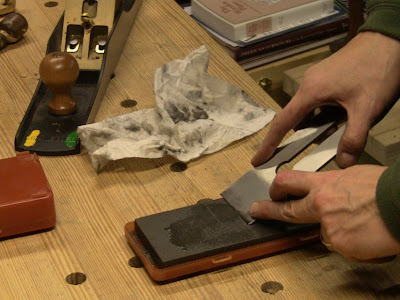 I did find it a touch easier to plane with the iron like this (at least, that's what I tell myself!). I planed the piece just enough to make both faces flat and remove the bulk of the sawmill marks. Then I marked both sides of the board with angled lines, one pair on one side, two pairs on the other. These lines clearly indicate which faces constitute the original board. Once I rip it and resaw the halves, I'll have 4 separate pieces. I want to be sure I can mate the matching pieces back together so the grain lines up. 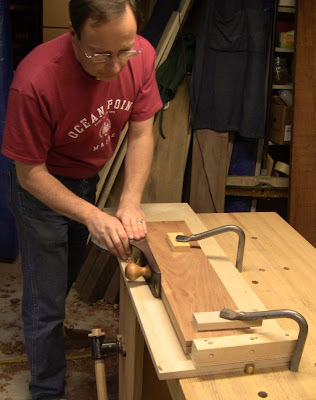 Using a panel gauge to mark a center line. Note the angled white lines to mark the surface. Before resawing, I took the time to resharpen the saw teeth. I need to make sure every factor is contributing to success here. Making sure the teeth are sharp before resawing. I resawed the two halves exactly the same way I did the earlier full-width pieces, repeatedly coming in from each corner until they all met in the middle. The only difference was the narrower width. 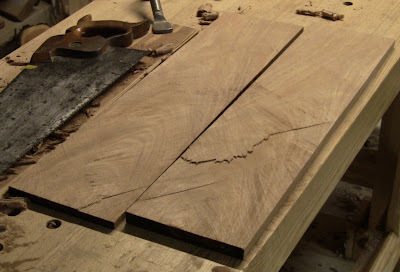 I also tried to be a little lighter on the saw and avoid any forcing through the cut that might cause it to bow. The first half resawn to yield what will become 1/4"- and 1/2"-thick pieces. I still got a bit of flap on the thicker piece (note the curved shadow line across it), but just on the order of 1/16" thick, well within the margin of extra stock thickness. After resawing the second half. Again, a bit of flap, but within acceptable tolerances. The pattern in the flaps between the two resaws is surprisingly consistent. That must mean there's something in my technique causing it. Maybe I'll be able to work out how to avoid that by the time I finish all the resawing on this project. The resulting pieces stacked and stickered on my bench. Other than the flaps, I was happy with the consistency of the thicknesses. These narrower pieces worked out well. 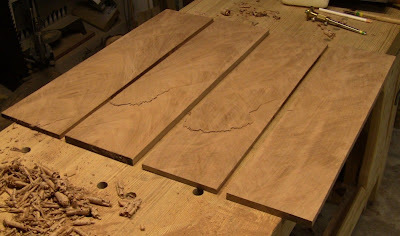 The next day, I lightly planed the sawn faces, again just enough to take out the flaps and make them lie flat. Then I built a large edge-shooting board. This is one of those luthier's tools. 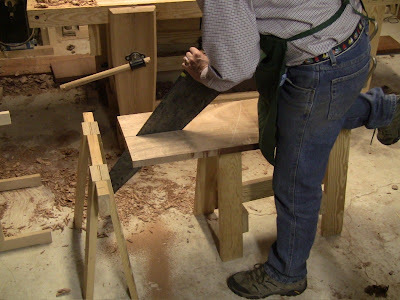 It's also one of the ways Toshio Odate shows using a Japanese planing beam in his book, Japanese Woodworking Tools: Their Tradition, Spirit, and Use. This is very simple, takes less than half an hour to build. The end stop doesn't even need to be perfectly square to the side, because this is not used for squaring up that way. I made mine from some good quality Baltic birch plywood scraps screwed together. Make the shooting board long enough for your pieces plus some extra length for starting the plane. Match up the two mating pieces, and fold them over the center line like closing a book. The spine of the book is what needs to be jointed. Then when you open it back up, the pieces should fit seamlessly. Everything setup for shooting. The work pieces overhang the ledge by 1/4" or so. The end stop may be enough to hold things steady, but I like the added security of the holdfast. It also keeps the shooting board from slipping around. Again, trying to align every little factor for success. Jointing the overhanging edges. Also experimenting with different ways of orienting the holdfasts. The key to all this is that the plane is referencing in two dimensions, along its length in usual jointer fashion, and on its side to keep a consistent angle. 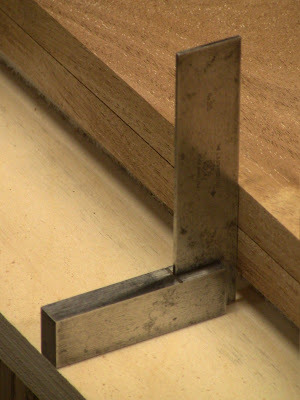 By matching the edges up like this, as long as you hold everything consistent, any deviation in the setting of the jointer iron from 90 degrees is canceled out when you open the pieces up, since the angles are then complementary. Wax the side of the plane so it moves smoothly along the ledge. Even with all this, it takes a bit of practice to learn how to handle the plane and avoid any rocking or rounding of the ends. The luthier's trick is to plane out a very slight concavity between the ends (just the thickness of a shaving), then take a full length shaving. 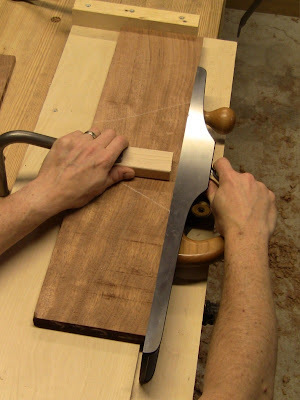 Because two halves of the same piece are folded over, one edge is guaranteed to be oriented against the grain, so don't try to take a heavy cut. 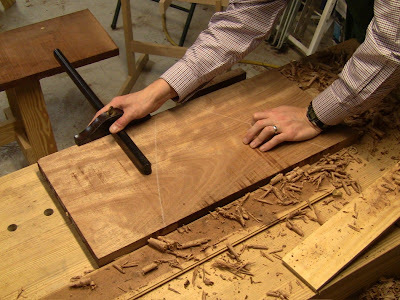 A few normal thickness shavings quickly even up the edge, then take light cuts to refine it. Checking for square. Looks pretty good! However, removing the pieces and holding them together along the joint shows a little light coming through. Additional delicate refinement of one piece. 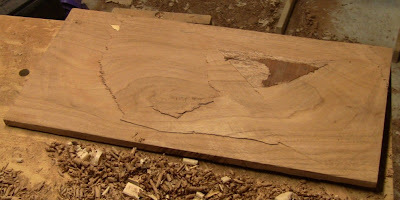 When doing single pieces, make sure to put them on the shooting board in their original orientation. Now that's a tight joint! Time for glue-up, again relying on luthiery techniques. I watched a number of different videos of gluing up guitar backs. Those are made from 1/8" stock, so luthiers have to be careful about causing buckling at the joint or in the piece when they apply clamping pressure. That makes them very creative in clamping setups. This stock is probably thick enough that I don't need to be quite that fussy, but I still followed general precautions. I used a piece of plastic-laminate-covered panel as my gluing surface, resting on blocks. It's very flat, and the glue won't really stick to it. 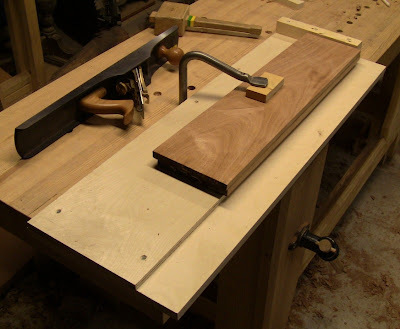 I clamped a length of 1x2 on one side as a side rail, then laid the first piece of mahogany along it, good face down. I spread glue along the jointed edge of the second piece and set it by the first, rubbing the two up and down the joint for good adhesion. Then I added a second side rail, left loosely clamped for the moment. I put two long V-blocks upside down over the joint, and loosely clamped another piece of 1x2 across them as a caul. The V-blocks apply down pressure to both pieces while accommodating any difference in their thickness, since I haven't bothered to make them uniform. 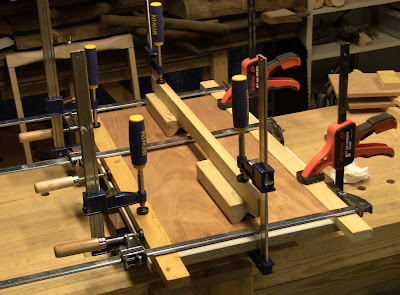 This keeps the pieces down flat and prevents buckling at the joint as I tighten up the bar clamps across them. Then I tightened everything up a bit at a time, watching out for anything to shift or lift out of place. It all sounds more complicated than it really is. Rube Goldberg clamping setup sitting overnight. This morning before work, time for the unveiling. Will all this trouble have been worth it? I removed the clamps, pushed a bit to make the glue release from the laminate surface, and flipped it over. Yeah, baby, that's what I'm talkin' about! Success! 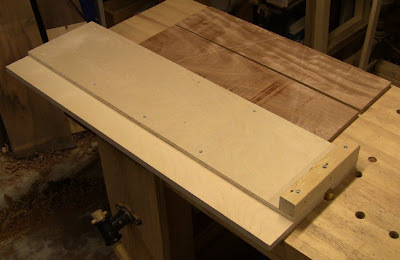 The glued-up panel was dead flat on the side referenced against the laminate. Just a slight glue line showing from squeeze out; that will clean up easily as part of final surfacing. The sticks are hard to photograph, but by eye they were perfectly aligned. Now I can plane this up on both sides to a uniform thickness. I'll do the remaining 1/2"-thick panels for the case this way. That will leave plenty of thin stock for other parts, some of which needs to be glued back up like this. 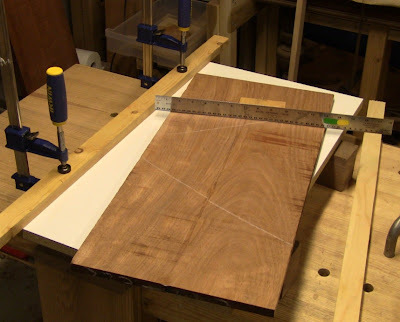 I like the tip on watching luthier's videos on glue ups. It's something I would not have thought to do. That's one of the nice things about the vast online community. You get to see how lots of people do things, even the wacky ones. That gives you lots of different ideas to pick through and adapt the ones you like. Steve, I've been thinking about this one. I wonder if it may have been a set issue?? Like, if there is some excess set in the middle of the blade on, say, the left side. 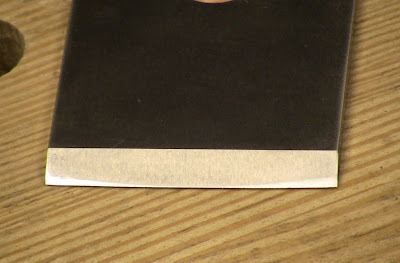 Its possible that in a normal cut it may be offset by the rest of the blade, and thus it cuts straight. But in a cut of that width, the blade can't correct itself. When I've sharpened my saws, I've tuned them for a straight cut through 1" stock, but when going through my own resaw project, the saw wandered more than normal. Anyway, like I said, just thinking. I was thinking along similar lines myself, that it might be something in the way I've sharpened my saw. I took a look at it and there's nothing obvious. Something I'll just have to work out with more experience. My Feb 2012 Fine Woodworking arrived yesterday. 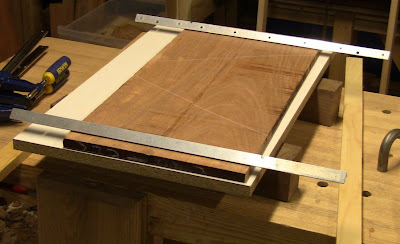 It has an article on making your own veneers (using bandsaw) that shows one of the luthier's glue-up techniques I considered. The method uses opposed wedges to apply clamping pressure against the side rails. It also shows weighing down with lumber to prevent buckling. It doesn't need much force in either direction. I think the main thing is to have it uniform and evenly distributed. Nice write up Steve. It's always great to try out a technique from another discipline. Hey nice Ocean Point, ME tshirt. I love it there. I have spent many an hour sitting in the Adirondacks staring out to sea.